Dewaweb Review 2019: Is Dewaweb a Good Hosting? Founded in 2014, Dewaweb offers cloud hosting and VPS from its base in Indonesia. With data centers in three countries, the company serves more than 32,000 customers around the world. 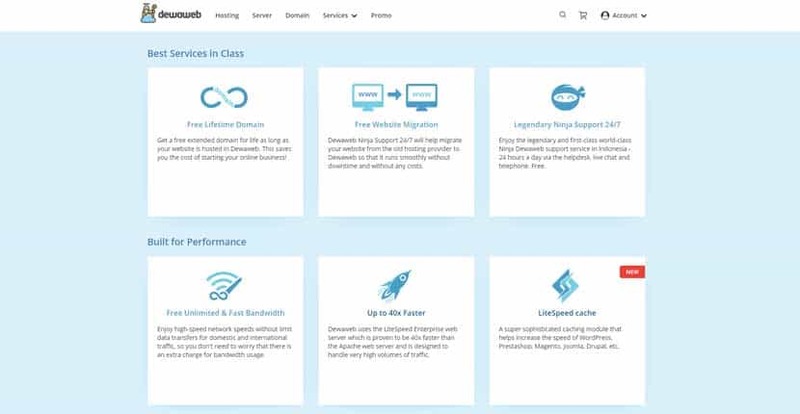 Dewaweb’s packages come with premium features like Cloudflare, Railgun, LiteSpeed Enterprise Web Server, free lifetime domain registration, and a rare 100% uptime SLA. In business since 2014, Indonesia-based Dewaweb strives to provide easy-to-use and affordable hosting to help customers succeed online. The company has now become one of the top providers in its home country and is one of the few to be certified ISO 27001, proving a world-class gold standard for Information Security Management. 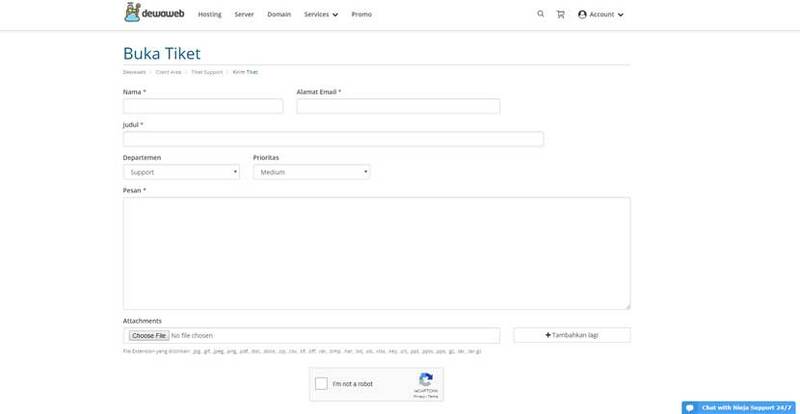 Dewaweb hosts its customers on a cloud-based infrastructure from servers located in Indonesia, Singapore, and the United States. With these servers, it serves more than 32,000 customers in over 15 locations around the world. Dewaweb’s services and support are available in Bahasa Indonesian. From lightweight blogs to high-traffic websites and applications, Dewaweb has created packages for almost every type of business hosting requirement. Its two primary offerings are cloud hosting and cloud-based virtual servers. Every plan includes Softaculous, accessible via your cPanel. From the Warrior plan onwards, you can also install WordPress plugins and themes easily from either ElegantThemes or LapakInstan, an Indonesian online shop theme website. Unfortunately, Dewaweb doesn’t include a free website builder in its cloud hosting packages. However, if you want one, you can contact the vendor for a 30-day free trial of the Strikingly Website Builder. One of the value-added features Dewaweb offers is that its servers are up to 40 times faster than regular Apache web servers because every server is equipped with the Litespeed Enterprise Web Server. This enables each cloud server to handle high volumes of traffic. Dewaweb’s setup also helps you get better load times with the combination of Cloudflare and Railgun. Cloudflare provides a Content Delivery Network (CDN), web optimizer, and firewall to protect against malware, bad bots, and DDoS attacks. Those alone already help with website loading speeds, but with the Railgun Network Optimizer, it gets even better. Dewaweb’s plans range from the entry-level Scout package to the highest-tier Guardian package, all of which are inexpensively-priced considering the features included. If you outgrow the resource allocations included in the Guardian package, you also have the option of going for one of Dewaweb’s cloud servers. There are three pre-made cloud server packages available at a fair price — but if you need something bigger for your company, you can also contact sales support to customize a server for your requirements. One thing I liked about Dewaweb is that it offers lifetime domain registration when clients purchase a hosting plan. That means you’ll never pay for your domain name registration as long as you’re with Dewaweb. Another plus is the nearly-unheard-of 90-day money back guarantee on cloud hosting packages. That’s far longer than the industry average of 30 days. If you only want to test the VPS, you can apply for a 30-day free trial. Customer support is available 24/7 via live chat, email, phone, and support tickets. The representative I was in touch with seemed to genuinely care about the issues I raised and was polite and resourceful. Aside from that, you’ll also have access to a knowledge base filled with comprehensive FAQs and tutorials. If you need fast and reliable cloud hosting in Indonesia, Dewaweb might just be the provider for you. With a rare ISO-27001 certification and well-built cloud infrastructure, Dewaweb has the ability to offer you streamlined performance few other companies can match. Wondering how Dewaweb stacks up against other Web Hosting companies? Enter any other Web Hosting company and we will give you a side-by-side comparison.